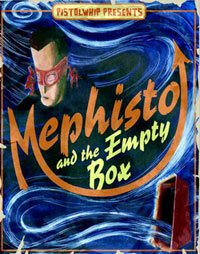 Presented by the team who brought us Pistolwhip in 2001, Mephisto and the Empty Box introduces us to a stage magician who harbors a tragic secret. In flashback, we witness a young couple on their honeymoon. With the new bride joining the original Mephisto in his performance on stage, she is seemingly caught in the crossfire of tragedy. Or is she? When her frightened husband rushes on stage, he discovers the cabinet empty and his wife gone. In desperation, he adopts the Mephisto act, perhaps in the hope of one day returning his young wife to his side. The story is short, without any unnecessary padding simply to fill pages and boost the price of the book. The tale is told in a succinct blend of words in pictures, as both dialogue and drawing trade off in a tag-team style narrative. I must admit I had reservations, not being a fan of the original Pistolwhip book, but was pleasantly surprised at the greater artistic range compared to the earlier book. The drawing is far more sophisticated, though still simplistic and cartoony. With a fairly low price tag, Mephisto and the Empty Box is a case of less being more, and far more enjoyable than some of the puffed-up product so commonly found today.